In concluding my 1965 study of early abstract color painting in America, I stated that the artists under discussion—Morgan Russell, Stanton Macdonald-Wright, and Patrick Henry Bruce among them—were “forerunners of a painterly vision still being defined today.”2 I was sure of that, but I could not know that by the end of the decade color painting would account for a good portion of the best work being done in America. Among those responsible for this surge of glorious color was a young artist who had not yet turned thirty. By 1970, in New York, Texas-born Robert Swain had launched a series of large-scale paintings of pure color, structured by a grid and composed of single squares of hues that seemed to be infinitely varied in their chroma, value, and saturation. This structure, with variations of divisions and emphasis, continued as the basis of his work until recently. Within this format, Swain found the means to an art of a virtually unlimited range of color effect and experience.3 The artist radically altered the character of his paintings in 2006, but nevertheless, color has been and remains the content of his art. The radiant, intense luminosity of Swain’s work can seem almost magical, even mystical, so much so that early on, the color might have seemed to have appeared overnight. But good art, of course, doesn’t just happen; it is almost always a long time in the making, and Swain’s first mature paintings appeared only in 1966, after long study and experimentation. In that year, he made a painting composed not of shapes filled with color, but with colors as independent forms, standing on their own, as autonomous pictorial elements in their own right. Swain did this by making lateral, crisscrossing, and intersecting bands of hues that created color areas, full and self-sufficient, independent but in unified sequences that filled and carried the painting. He had found the means to fully engage color as a formal and expressive language of its own, within the realm of abstraction, which freed it from its conventional role as a supporting agent for drawn shapes. His discovery, some forty-five years ago, opened a new world for Swain, a world that he has explored fruitfully, without pause, to this very day. One thinks of the young Paul Klee, who exulted after he had discovered color in 1914, “Color and I are one. I am a painter!”4 Four years later, by the time Swain had turned thirty, his talent had outpaced and belied his young age, and he had to be counted as one of the major talents to emerge during the 1960s. Swain’s journey can be traced to his boyhood. His only respite from the tropical heat of south Texas came from the study of nature on long walks and from drawing for hours on end on his grandmother’s porch. He remembers well the fluctuations of light on the Texas landscape as day turned into evening, a beautiful and recurring experience for anyone who has experienced it. Light, of course, is synonymous with color, so Swain believes that his exposure to natural phenomena formed the basis of his visual knowledge at this early date. We never forget our early impressions, so it is no wonder that his paintings have always been marked by their intense luminosity. It may also explain why this writer feels strong overtones of landscape in the work, especially the movement and change of light across the surface; the paintings may be abstract but they convey strong emotional experience. As a teenager his family moved to the Washington, D.C. area, where he discovered the National Gallery of Art, for him an unlimited source of treasures. He scoured the collections ranging from the thirteenth through the nineteenth centuries. He was drawn especially to three painters, Raphael, Rembrandt, and, in particular, Vermeer, whose famous Girl with the Red Hat, c. 1665-66, is a painting he still cherishes and studies intently whenever possible. 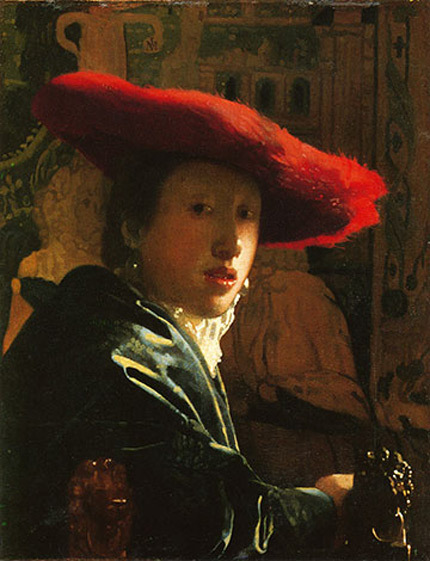 He was struck by how the “formal elements could visually impart the content through the articulation of color and compositional elements.”5 In Vermeer, hues are closely equated with the forms; color modulation illuminates the painting, filling it with the light for which Vermeer is famous as it spreads across the canvas; the blues, reds, yellows, all primaries are gradated in careful calibrations throughout the surface.6 Swain came to understand that the experience of a painting relied on its perceptual structures, which could thereby engender deep personal feelings and reactions. From the start of his education, then, he saw first-hand how color speaks to us at our deepest emotional and psychic core. From the beginning, color was the content, the credo on which he has based his art for a lifetime. In the late 1950s, Swain traveled throughout Western Europe, visiting the major cities and their majestic museums. It was a rare and valuable education, based on seeing first-hand important works of art, rather than the poor reproductions used in classroom settings. As he traveled, he noticed that whatever the subject or structure was in the old masters’ work, it was always color that was the “alchemist that ushered in the decisive aspect of the experience.”7 He came to realize that color, the actual pigments, are material facts, real unto themselves, not descriptive, but expressive in themselves and made more so by the method of application. By the time he returned home, he had learned much about the art of painting and its making. But he lacked a real sense of how color actually functioned. Back in Washington by the early 1960s, Swain found work at the Phillips Collection as a guard, maintenance man, and all-around handy man. There was no decent course in color available in Washington, but Swain continued his self-education at what is no doubt still the best place in America to look at painting. The intimate galleries, fashioned from the rooms of a private house, still afford an unique immediacy and intensity of the viewing experience. For Swain there could be no better place, for the founder, Duncan Phillips, had built his collection around the great masters of color painting, from Pierre-Auguste Renoir’s famous Luncheon of the Boating Party (1881), Pierre Bonnard, and Henri Matisse to a small gallery set aside for several paintings by Mark Rothko. Working there on a daily basis, one could not help but be immersed in an atmosphere of color. Most important for Swain Cézanne’s famous The Garden at Les Lauves, c. 1906, one of his last paintings. It is usually thought of as unfinished, but we need to remember the old adage that a painting is finished when it’s finished enough; it was no doubt finished enough for Swain. Even its “incomplete” parts, the open areas of unpainted canvas, served him well. The open areas become another color, heightening the intensity of the painted hues, and focusing our eye on the color areas. In the central area (the painting can be said to be divided into five zones), patches of blue, orange, and green abut each other, standing as independent shapes, not really describing anything but embodying what Cézanne called his “sensations.”8 They make forms, free and clear in spots, but mostly fusing into another area of different hues and values. This process has been called modulation, or more specifically gradation, producing harmony of contrasts, or harmony of analogous colors. These methods were defined and described by the great nineteenth century color scientists Eugene Chevreul, Charles Blanc, and Ogden Rood and have come down to us unchanged, although they are now used as the basis of a modern abstracting type of painting. These methods have been at the heart of Swain’s work until recently, when he developed his brushstroke paintings in 2006. In this Cézanne, the color areas resemble Swain’s color units, though the latter’s work is clarified and more precise. Similarly, Swain often employed a composition in which extreme hue and value, ranging from white to a dark, almost black hue start at the lower left and move to the upper right corner, as Cézanne does in the lower left and top right sections of Les Lauvres. Cézanne’s patches of constructed color led to Matisse’s work of 1905-1908, and subsequently to his monumental compositions of the later 1910s. So, too, the frontal intersections of the color areas form the basis of the Cubist grid, developed by Picasso and Braque by 1909-1910. 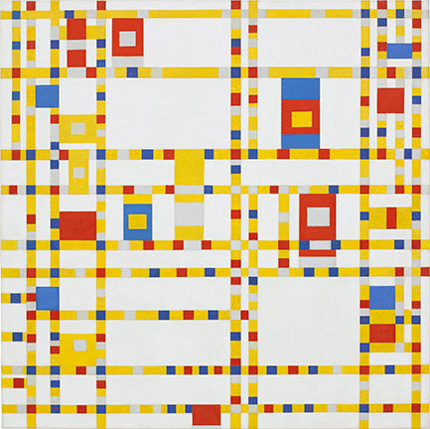 By 1917, Mondrian had extended the grid to the entire surface in a way that later allowed Swain to use it in mural-sized paintings, a natural conveyance for his colors. These key figures of the early modern movement studied Cézanne intently and at length, understanding that he was the pivotal force that had to be assimilated to move painting forward into a new realm. We can say that Swain recognized the very same thing. Virtually every noted painter of color has started with Cézanne. More treasures at the Phillips demonstrated for Swain the possibilities of color as a powerful visual medium, in particular a 1935 painting by Wassily Kandinsky titled Succession. It was a new kind of painting experience for him—the painting was carefully divided and organized in five horizontal tiers of space, almost like lines of a musical staff or text in a book. (It was as if Kandinsky had made the divisions in the Cézanne clear and literal.) In these tiers there is a wide band of linear, highly colored shapes, some organic, some geometric. Together they formed a unique visual language, based on an evident logic and clarity, far different from the prevailing heavy and dense surfaces of Abstract Expressionism that more often than not hid and obscured color. In this work colors stand independently, each distinct in the composition, each unique in its own right. Swain saw it as a work of a premeditative thought process; it helped him to begin to think of a new way of structuring a painting. Elsewhere in the Phillips Collection, Swain was dazzled by the sheer color luminosity of the Rothko paintings set aside in their small private gallery, and took new hints about the contrast of light and darks in the Matisse painting of 1948, Interior with a Egyptian Curtain. Indeed, if his studies were self-guided, at this point he had, perhaps unknowingly, linked himself to a long history of color painting in America, a history in which he now holds a distinct place. This history has never been written in full, but it is there, an important part of modern art in America. It can be traced to 1904, from the discovery of Cézanne in Paris, just as Swain had later discovered Cézanne at the Phillips Collection. In that year, a small group of American artists, collectors, and writers working in Paris had begun to uncover revelations in Cézanne’s late work as it had gradually made its way to Paris and its progressive galleries. (We need remember that Cézanne had been something of a recluse in the south, with little of his work to be seen in the capital.) Foremost among these figures were the Steins, especially Leo, as well as Michael and Sarah, young collectors and patrons from San Francisco. Gertrude, the most famous member of the family, took her hint from the others, and her famous salon soon became a primary viewing place of Cézanne’s art. At the same time, Matisse worked to absorb the lessons and implications of Cézanne’s art. By 1907, no one understood the elder painter as well as he did, and it became the basis of his teaching and his art. At the request of the Steins, and of two young American painters, Max Weber and Patrick Henry Bruce, Matisse opened his famous school in early January 1908 with those listed above all in attendance. Matisse emphasized the primacy of color, echoing Cézanne’s statements, among them, that “when color is at its richest, form is at its fullest; color and drawing are not distinct; one should never say model: one should say modulate; the painter must become classical again through nature, or in other words, through sensation.”9 All, especially the last, relate closely to Swain and his art, especially when we recall that Swain’s sense of art had started with nature. 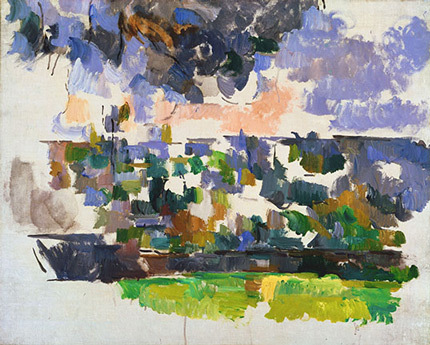 Color is elevated to the status of line for Cézanne, and then for Matisse, thus eliminating the old preference for Florentine disegno over Venetian colore that dates to the sixteenth century.10 One is tempted to think of Swain in Matisse’s school, studying Cézanne closely, only now the class was being held at the Phillips Collection. In any case, we can trace the formal start of American color art to 1908, in the Matisse school, where Cézanne’s principles were widely disseminated. In his famous “Notes of a Painter,” also published in 1908, Matisse called for an art of calm and repose, an art to soothe the tired businessman in his armchair.11 Matisse was speaking of a meditative, spiritual condition that recalls eastern thought, but it has always been misunderstood. Instead, it led to the simplistic idea that color is “too decorative” in the pejorative sense, too easy, devoid of emotional or intellectual content. In fact, nothing could be further from the truth; color art is as demanding and difficult as any other type of art. As Swain’s education demonstrates, it requires long, dedicated, and arduous study to develop a fine-tuned color sensibility. (As of today, Swain has developed his own color system, which consists of 4,896 colors, made up of thirty hues and thirty-three value steps, each with nine or more saturation steps.) Color is energy, a “firing of the eye”12 and the psyche. The energy conveys emotions and feeling in both the artist and the viewer; therefore it is as intensely moving and poetic, as emotionally potent as any other kind of art. Swain was also taken by the color and composition in the work of a now little-known artist, Karl Knaths (1891-1971), who was collected in depth by Duncan Phillips. Knaths should be better known, for the quality of his art is immediately apparent and one can see why Swain was attracted to the work. 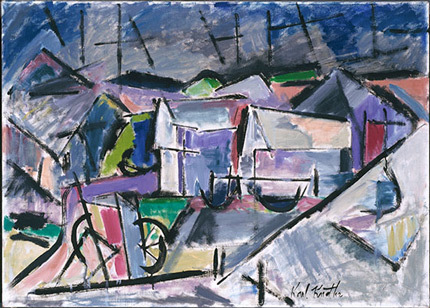 Knaths’s colors are deep and rich, loosely arranged about a partial Cubist scaffold; they are lyrical and highly expressive, and clearly reflect a lengthy practice with and deep understanding of color. Swain went to Provincetown and worked there for thirteen months for Knaths, doing the usual studio tasks of a young assistant, much as young men would be apprenticed to Renaissance artists. It was just what he needed, for Swain thereby gained practical experience with the art of painting, as well as a deeper knowledge of its compositional elements, including color, and the basic issues confronting the artist in his studio. Knaths worked from the Ostwald Color System, one of the most advanced and widely used color systems in modern art. Based on harmonies, it was a reliable way to get the painting going in terms of its color structure, then allowing the artist to build on that to achieve his own personal canvases. Knaths had a highly developed musical sense and a wide knowledge of artists’ writings. 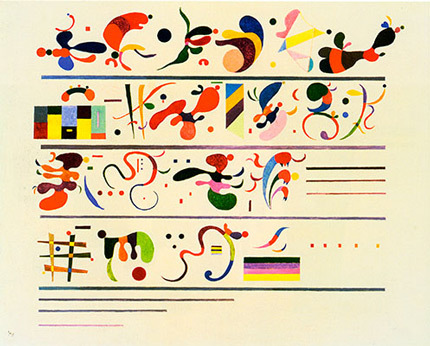 Together Knaths and Swain would read canonical texts by Kandinsky and Klee. From here, it is no surprise that Swain’s first real paintings were based on cubism, in the manner of Albert Gleizes. His mature paintings didn’t come easily or quickly. For at least a year Swain was stuck, and depressed, until he found a way to liberate the color he had come to love, to find a way to let it speak, even to sing. This breakthrough finally came in 1966 with the discovery, in the “bands” painting, that color could make its own shapes and thus truly stand on its own and be the real subject of his art. By the early 1970s, Swain was a well-known and highly respected artist, as well as a much-admired teacher at Hunter College, where he continues to serve in a department that has long supported color painters. His paintings became more complex, more filled with the energy and light that only color of such intensity can generate; and they have evolved into new formats, well described in the other texts in this catalogue. But shifts in taste and art practices that no longer value the expressive and structural uses of pure color, or even painting itself, have pushed color into the background. In recent decades color came to be identified almost exclusively with the painterly color-field artists associated with Clement Greenberg, all of whom—artists and critics alike—are now vilified. Swain was never associated with Greenberg or his circle, but color painting of all kinds, including Swain’s type of hard-edge art, was and continues to be widely dismissed as emotionally empty, “decorative” in the pejorative sense, and even worse. This will remind us of the turn against Impressionism in the early twentieth century, when it was widely considered structurally weak, too easy, and without real substance. But soon enough, Impressionism was re-evaluated; the same will happen with color painting. Good art always wins out. By1910, Cézanne’s art, especially his late work as seen through Matisse’s eyes, had inspired a new generation of American artists. The great Cézanne retrospective of 1907, held in the annual Salon and at Vollard’s, were turning points in the history of American art no less than world art, for in his work artists were accorded instant access to the most advanced modernist interpretations of color and the grid. Matisse’s most important lessons, however, were not those about Cézanne that he conveyed to students but were most readily and indelibly apparent in his own art. His work was first on view in America in April 1908, at Alfred Stieglitz’s famous gallery 291, and while only one painting was included in that debut presentation, it was enough to demonstrate the possibilities his art offered to aspiring younger artists. After 1908 his art could be seen in the collections of Gertrude and Leo Stein in Paris, where their open houses were obligatory stops for emerging American modernists on their trips abroad. At the groundbreaking Armory Show in 1913, America saw the full expressive and formal range of Matisse’s art; no less than thirteen paintings were on exhibit, including the now canonical Red Studio of 1911, a work which has its own special history in American art. It is a touchstone for color painting, the first true color field painting; that is, color as a full field, the panel of red acting as a full sheet or envelope of color that carries the painting as a single entity. It had an immediate impact, for very different reasons, on a wide range of Americans. In 1917, the young Stuart Davis initiated a practice he continued throughout his life of engaging with artists and particular works that he found offered special challenges. 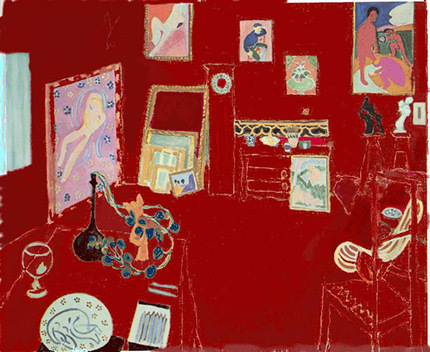 Davis created his own version of the Studio in which he introduced more color variation and pictorial incident, as if to try one-upping Matisse. This began a lifelong dialogue with Matisse’s color, accounting in great part for the development of Davis’s own special gift for color. The history of Red Studio took a crucial turn in 1949 when the Museum of Modern Art acquired the painting and put it on permanent view. 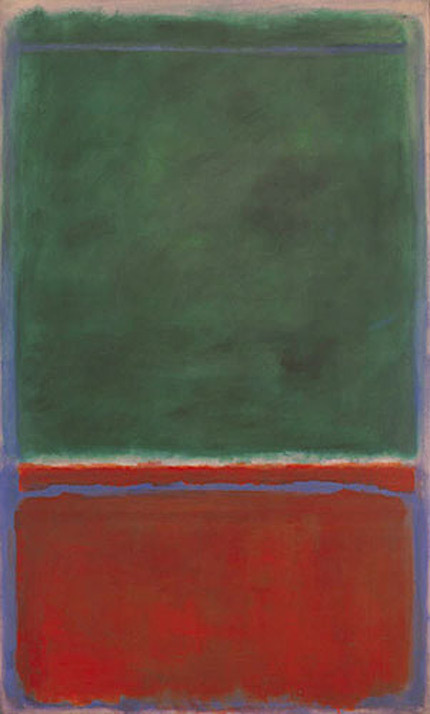 There Mark Rothko, one among the countless artists affected by it through the years, studied it intently for extended periods and found in it the last and determining factor that enabled him to break through to his mature style of floating rectangles of luminescent color. We do not associate Matisse or the Red Studio with the gestural branch of Abstract Expressionism, but an examination of the all-over red surface of de Kooning’s Gansevoort Street, ca. 1949, suggests just how closely others had been looking at the recently acquired painting. By 1914, American painters, Patrick Henry Bruce and Arthur Frost among them, as well as the Synchromists Morgan Russell and Stanton Macdonald-Wright, were at the forefront of the drive towards an abstract art based on pure color. American artists were often considered behind the times, but in the years before World War I they were known and respected members of avant-garde circles in Paris, and were an intrinsic part of the international drive towards a new and modern art. Together with the French artists Robert and Sonia Delaunay and the Czech painter Frantisek Kupka they helped to forge a visionary art of color abstraction, termed Orphic Cubism by Guillaume Apollinaire, which included some of the best painting being done in Europe and America. By 1914, the broad movement to color abstraction was in full view in public exhibitions in Paris. This development was widely commented on by the leading critics of the day, and its influence spread quickly and widely. High-keyed color was soon apparent in the work of Marsden Hartley, who was also influenced by the color used by Wassily Kandinsky and the Germans Franz Marc and Emile Nolde, among others. Arthur Frost and Stanton Macdonald-Wright were forced by the outbreak of war in 1914 to return to New York, where they began to spread the principles and possibilities of the new color painting to other, surprisingly diverse groups of artists. Indeed, by 1918, color painting had already been seen in some depth in New York. Wright and Russell had shown together at the Carroll Galleries in New York in 1914; Wright’s show at 291 in 1917 attracted wide attention, and among those who drew from his example was Georgia O’Keeffe, whose palette immediately took on the luster of high and intense color. Even as improbable an artist as Thomas Hart Benton, Wright’s close friend and student in those days, was prompted to do a series of color abstractions in 1917-1918. To be sure, this episode did not last long, but from it Benton learned key lessons of color application that were at the core of his painting throughout his career. Benton’s style of mannerist contraposto had come from Wright as well, and in the 1930s Benton passed this on to Jackson Pollock, which was one source of Pollock’s famous all-over poured compositions of 1947-1950. So , too, Arthur Frost passed on the methods of color painting at the same time to a group of artists working in New York. Chief among them was James Daugherty, who quickly adopted these techniques as the basis for a series of abstractions and quasi-figurative murals that he continued until his death in 1974 and that mark him as one of our important modernists. Indeed, Daughtery’s art flourished again in the 1960s just as the young Swain, fifty years his junior, began to explore color in his own way. A crucial event for Frost and Daugherty was the arrival of six of Bruce’s latest paintings from the artist in Paris in 1917, the Compositions, now at Yale and the Houston Museum of Fine Arts, all dated 1916. These large paintings, still glorious today, are high points of color abstraction. They carried the same powerful color chords Frost had known in Bruce’s art prior to 1914, but Frost was stunned by a new element, never seen before in Bruce’s work: the extensive use of large areas of black and white, elements previously omitted from chromatic color but now employed as additional primaries, a practice used by Matisse and codified by Wilhelm Ostwald, a ranking color scientist. The use of black and white further extended the possibilities inherent in color abstraction and further extended its expressive range. These paintings were acquired by Katherine Dreier for the collection of the Société Anonyme and were exhibited at the group’s galleries in New York in the early 1920s. Daugherty learned quickly, and in turn spread the methods of color to his circle of friends, including Jay Van Everen, who did an extended series of abstractions during the 1920s. Although we still know very little of their exposure to color ideas, artists as distinctive as Joseph Stella and Morton L. Schamberg incorporated full color structures as the basis of their art by 1913. This use of color, far deeper and more widespread in America than we supposed, makes it clear that as a formal and expressive methodology it has been as important as Cubism in the history of modern art. Yet we have been slow, reluctant, and even afraid to understand its full importance, a phenomenon that has a name: chromophobia. The reasons for its continuation are numerous. American and world modernisms were dispersed and fragmented by World War I, making these developments seem brief and of little consequence. On the contrary, they continued and gained new converts, and although modernism did not end in the 1920s, as is still widely and erroneously believed, the momentum of a perceived movement was no longer available, thus disguising its true importance. Rather, older artists continued their color explorations in the 1920s as independents, often isolated but no less productive. Patrick Henry Bruce, leading a solitary existence, critically and commercially forgotten, made a series of great purist still lives based on a new investigation of color volumes that rank among the best paintings done by any American of the time. Daugherty and Van Everen continued apace, as did Alfred Maurer, whose still life paintings of the late 1920s are among the major monuments of Cubism and color painting. By the mid-1930s, major artists such as Arthur Dove, Georgia O’Keeffe, and Stuart Davis had mastered a vivid and original use of color, which became the expressive force at the heart of their work. We have missed much of this history, as a history, because of the long-standing prejudice against color. Florentine disegno was seen as more complex and intellectual, while color was viewed as too easy, too sensual, in a word, too decorative. 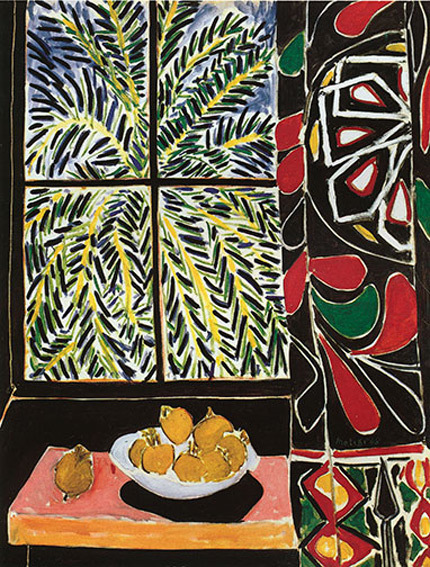 For many, the strong graphic lines, fragmented planes, and dark hues of Cubism seem more difficult (and modern art was supposed to be nothing if not difficult) than the free-flowing sensuous colors of Matisse, who did not help matters with his famous remark about the armchair, a comment he instantly regretted. The graphic bites into the surface, giving line an apparent weight and density that is equated with complexity; but complicated is not the same as complex. Color, to cover the canvas, must glide across the surface, making it seem, at first, literally less weighty and less complex. We persist in seeing the decorative as inferior, not understanding its real meaning and its ability to establish an overall program or scheme for an interior or a single painting. Giotto’s first task at the Arena Chapel was to design and install an overall decorative program. So, too, color appeals to our emotions, which terrify us, and, unable to confront them, we avoid the powerful and compelling stimulus of color and its effects. Among the primary color principles are the law of simultaneous contrast, by which juxtaposed colors will be influenced by the complementary of the other; the law of successive contrast, which states that a new color will be produced on the retina after the eye is shifted quickly from one color to another. Two other principles, the law of harmony of analogous colors and the law of harmony of contrasts, state that colors either adjacent or widely separated on the spectrum will each produce harmonious relationships. Related to this is the principle of gradation, by which colors in a given area are modulated to lighter or darker tones by small (or even no) intervals. Harmonies can also be produced by massing color in pairs or triads, as the composer creates a musical score; the analogy between creating an abstract painting and crafting a musical composition was often evident in the work of many modern painters. These principles still remain in wide practice, augmented by other, more recent propositions such as that of film theory, developed by David Katz, which points to the way a color field will appear to detach itself from the canvas. This principle is particularly apparent in those paintings by Swain in which the color seems to appear as a separate, physical reality in front of the canvas. Work from the 1950s and 1960s by two old masters of color, Hans Hofmann and Josef Albers, clearly demonstrated their continuing importance to color in America. In fact, their roles in American art can be traced to their arrival here, in the early 1930s, as the first of the émigré artists to escape Nazi Germany. No other artists actually working here had a greater influence on the spread of color in American art than Albers and Hofmann. More than any other artists they—and Matisse, of course—were responsible for the development of color usage on such a wide scale in America after 1950. Soon after their arrival they quickly became legendary teachers who had a profound effect on successive generations of artists, Hofmann in New York and Provincetown, Albers at Black Mountain College and, after 1950, at Yale. Indeed, Clement Greenberg once remarked that in the 1930s at Hofmann’s school you could learn more about Matisse’s color than you could from Matisse himself. It was as if Hofmann’s classes were a later extension in America of Matisse’s own school, which had opened in 1908. No one has ever disputed their importance as teachers, but the greatness of Albers and Hofmann as working artists has never been fully appreciated, which is an unfortunate deterrent to our full understanding and appreciation of American art. For it is through their work as artists productive to the end of their lives that the advancement of the possibilities of color for abstract art had its most telling impact. In fact, both were making significant paintings much earlier than we have supposed, certainly by 1940. While still not well known, these are works of note that belong to the history of color painting in America. Albers and Hofmann were, of course, not the last artists to escape Nazi Germany and enrich American culture. The arrival of Piet Mondrian in New York in 1940 was also an event of great importance. That Mondrian’s clarity and probity of structure offered new challenges is of course well known. Less understood is the valuable example his color offered, and a good case can be made for the optical vibrations of his seminal wartime painting Broadway Boogie Woogie as one of the first color field paintings. Together, these Europeans—Matisse, Albers, Hofmann, and Mondrian—were crucial to the introduction of diverse methods of color application that set the stage for the great burst of chromatic abstraction in America after 1950. To this list, we can add Knaths for his importance to Swain. The surge in color in postwar painting begins with Rothko, Barnett Newman, Clyfford Still, Ad Reinhardt, Sam Francis and concludes fifteen to twenty years later with Helen Frankenthaler, Morris Louis, Kenneth Noland, Jules Olitski, Larry Poons, Ray Parker, and Frank Stella. These later artists are identified as color field artists. But the term needs to be expanded to include artists such as Swain. Indeed, Swain should be considered a member of the Washington Color School, a fact that reminds us that we still need a thorough study of that cohort. But however we term it, after forty years, Swain had compiled an enormous body of compelling work in which any artist could take pride. It would have been easy enough for him to continue in the same style, with new variations, new twists and turns, as he had for all those hard-won years. Thus it came as no small surprise to his friends and colleagues when in 2006 Swain introduced a radical new format to carry his intense color. Gone, apparently, were the grid and single squares of high and individuated hues and values, replaced now by free-floating biomorphic shapes of, at first, two colors that seemed to move up and across the surface, from lower left to upper right. He began with two hues, and since then has moved to three and even four hues in action at once. Swain’s surfaces were never totally matte, for granules of paint were always evident upon close examination, but in the new paintings, which he calls the “brushstroke” paintings, the presence of the hand is now clearly evident. The surfaces are distinctly built up with raised pigment; ridges and valleys ebb and flow over surfaces created by constantly changing densities of paint. We can feel the painting as a low relief, if we could run our hands over the surface, which gives his art a literal, tactile feel not present before. Swain had previously gravitated toward the linear and its precision, but it is a law of life that to get something one must give something up, and to get this order Swain had to give up drawing and brushwork, which evidently he missed. Indeed, he had tried a few brushstroke paintings in 1966, but he dropped the idea since he was not satisfied with them. Simply enough, we may say he reclaimed it for these late paintings. They are stunning paintings, giving us a new kind of experience. But what, we will ask, brought this about? The shift in Swain’s art—undertaken when he was sixty-five—can be seen as part of a long tradition of old-age art in which, after a lifetime of labor, artists make dramatic shifts rooted in new experience, a newfound sense of freedom, a drive to push their limits, almost a devil-may-care attitude. They have nothing to lose. Often it comes from a new sense of spirituality, a coming to terms with oneself and the world, as it did for Michelangelo, Rembrandt, and Titian, all famous for the loosening of their early art into a painterly haze that seems otherworldly to us. Cézanne sought a new classical monumentality in his late Bathers. After a near-death experience with an almost fatal illness and operation, Matisse let it fly, abandoning any limitations on his conception of color realization, plunging himself to huge areas of pure, unmediated color in his radical paper cutouts produced between 1943 and his death in 1954. Matisse virtually invented a new medium, a fusion of painting, drawing, and sculpture, by cutting directly into the paper with scissors, as a sculptor would carve into his/her material. In his last painting, Mondrian was clearly exploring new expressive territory by mixing paint and tape, making a new, built-up painterly surface. When his friend and disciple Charmion Von Wiegand saw the new painting, she exclaimed, “But master, the theories!” Mondrian smiled his quiet smile and replied, “Painting first, my dear, theories later,” which tells us much about art in general, and color painting in particular.13 So, too, Stuart Davis loved clearly drawn lines but he also cherished paint as a material and the surfaces it could generate, and his work is a fusion of line and surface. The effects, as well as the format and technique, in Swain’s late work are new, but they still have their roots in the earlier work. It is certainly just as concerned with color as his earlier work, but now color is given more weight, density, and surface texture; there are varying amounts of pigment in different areas of his compositions, and there is a new freedom and movement to the shapes. The shapes start at the lower left, just as the lighter colors always did in the grid paintings, and then move to the upper right, becoming larger and more diffuse in their disposition on the surface. The movement is unmistakable, hurried on by a new openness and freedom of expression for Swain. Like Matisse and others, if in different ways, Swain lets the grid go, allowing color to literally explode upon and over the surface, filling the painting field with a new and more intense kind of energy. There is new playfulness to the brushstroke paintings, a kind of liberation, a new sense of possibilities and the willingness to pursue his instincts. It’s a move that takes great courage. We will recall that this type of movement was evident in Kandinky’s 1935 painting Succession, which had been so important to him as he was first developing his color art. The shapes in Kandinsky’s work dance and move with joy, controlled but buoyant, something like certain shapes in Matisse’s late paper cutouts. In Swain’s newest paintings there is an explosive release of the color that had been so carefully controlled for many years. It’s as if color has entered into a third dimension, and we are given a color experience based on pure sensation. Seeing these works is a rare and beautiful experience. We might look back even further to the Cézanne at the Phillips Collection, Les Lauves, a painting that had so deeply affected Swain. Here too the space is empty at the lower left, and moves towards a full density of paint in the upper right. Here also Cézanne’s color patches move freely yet are connected to an overall order and structure. In certain of Swain’s brushstroke paintings Cezanne’s patches of color, clear and distinct and self-contained worlds in themselves, seem to have been reborn. So, too, we need remember, the influence of Tony Smith, Swain’s mentor at Hunter College, and think of how Smith’s paintings often feature free-form shapes that seem to move of their own accord while still anchored to the overall structure. At the same time we might say that this is part of a course his work has followed for more than twenty years, moving from a strict grid to variations of color areas that seem to skip and move over the surface in larger and smaller areas of light and hue. We cannot say where Swain will next go with his work but we can be sure that he will, as always, take us into new realms of visual experience. His explorations continue, part of an approach to painting whose possibilities, as I had said in 1965, and confidently repeat here, are still being defined today, and will be for years to come. 1	William C. Agee, Synchromism and Color Principles in American Painting, 1910-1930 (New York: M. Knoedler & Co., Inc., 1965). 2	William C. Agee, “Synchromism and Color Painting in American Art,” in Color and Form: 1909–1914, (San Diego: Fine Arts Gallery of San Diego, 1971). 3	Klee’s full statement on color was: “I now abandon work. It penetrates so deeply and so gently into me, I feel it and it gives me confidence in myself without effort. Color possesses me. I don’t have to pursue it. It will possess me always, I know it. That is the meaning of this happy hour: Color and I are one. I am a painter.” Felix Klee, ed., The Diaries of Paul Klee: 1898-1918 (Berkeley: University of California Press, 1964), 297. 4	All quotes relating to Swain come from interviews with the artist held between October, 2009, and June 2010. Hereafter they are referred to simply as Swain interviews. 7	Paul Cézanne, in many sources, and used many ways. See Gail Stavitsky and Katy Rothkopf, eds., Cézanne and American Modernism (New Haven: Yale University Press, 2009). 8	See Gail Stavitsky and Katy Rothkopf, eds., Cézanne and American Modernism (New Haven: Yale University Press, 2009). 9	David Batchelor, Chromophobia (London: Reaktion, 2000). 10	Matisse, “Notes of a Painter,” 1908. Reprinted in Jack Flam, Matisse on Art (Berkeley: University of California Press, 1995), 42. 11	See my essay on Sam Francis in , Sam Francis Paintings 1947-1994 (Los Angeles: Museum of Contemporary Art, 1999). 12	See William C. Agee, Charmion Von Wiegand: Improvisations (New York: Michael Rosenfeld Gallery, 2003).